Just a few days back Apple released iOS 7.0.5 and now the Evad3rs has made their Jailbreak tool to support the latest version of iOS . Apple officially launched iOS 7.0.5 for users outside US, but it didn’t have much improvements to the interface (Hopefully some bug fixes). Immediately after the 7.0.5 release, the genius out there in Evad3rs started working on a Evasion7 update and now the jailbreak version 1.0.5 is available for any device running iOS7. Well, if you have updated to iOS 7.0.5, then download Evasion7 1.0.5 from the Evad3rs official website. 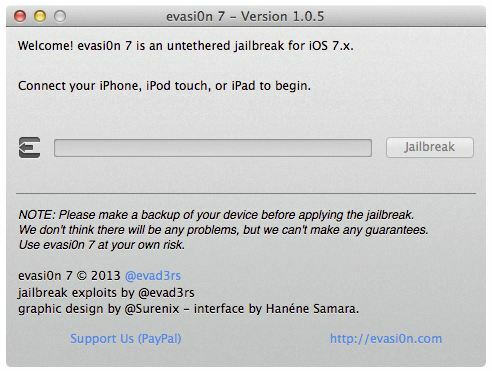 Not sure how to Jailbreak using Evasion 7? Checkout our Windows and Mac guide.